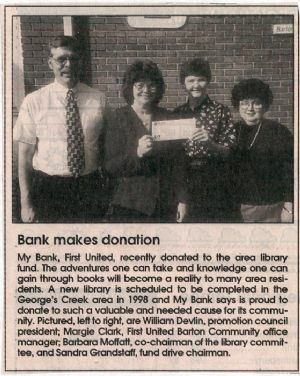 My Bank, First United, recently donated to the area library fund. The adventures one can take and knowledge one can gain through books will become a reality to many area residents. A new library is scheduled to be completed in the George's Creek area in 1996 and My Bank says is proud to donate to such a valuable and needed cause for its community. Pictured, left to right, are William Devlin, promotion council president; Margie Clark, First United Barton Community office manager; Barbara Moffatt, co-chairman of the library committee, and Sandra Grandstaff, fund drive chairman.